Information on raising ducks for either meat, eggs or just as backyard pets. Know what duck breeds will suit your needs, how to feed, house and take care of your duck. People keep ducks for different reasons. Some keep ducks for breeding, others keep ducks for the meat or duck eggs, or both. Others may keep ducks to keep down the fly population on a farm that has livestock, and others may not even know why they are keeping ducks, except for the pleasure they bring to the family and their farms. Keeping a duck is like any farm animal, you have to give thought to where they will be housed, their safety from predators during the day, swimming facilities, food and health, and any offspring that might come about during their duration. How long to ducks live? Ducks live for a number of years, but of course that can differ from species to species and whether they live in captivity or in the wild. On average, however, a duck will live around 15 years. A Pekin duck will live 9-12 years, a Mallard 15-20 years and Muscovy ducks 10-20 years. For most ducks, your eggs will take 4 weeks to hatch. This is the time where ducks appreciate water where they can frolic in, as the moisture from their feathers seems to be important for egg setting. If you are keeping Muscovies, Muscovy ducks take 5 weeks to hatch. 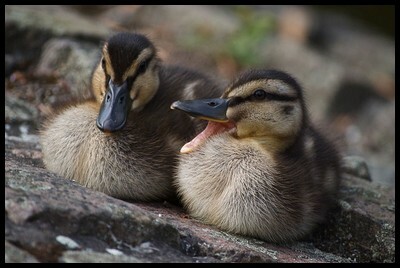 Ducklings, or baby ducks should be fed a commercial duck starter which should be pelleted rather than given as a mash. They can also be given fruit and vegetable scraps but these must be cut up really small for the ducklings. They also enjoy insects and worms. Do not feed them onions, rice, whole grain, dry bread or wild or caged bird seed. Protein is a very important part of a duck's diet for healthy growth. When you give your ducklings a starter feed make sure that it has a protein content of at least 20% for the first 3 weeks of their lives. Adult ducks still need protein in their diet, but only 16%. Laying ducks need 18% protein. If ducks are on the water they are known as a raft, a paddling or a bunch of ducks. If ducks are in flight they are known as a brace, a team, a bed, a flight or a flock of ducks. You can also get a badling of ducks. There are many types of duck breeds about and as a novice duck owner-to-be you are probably overwhelmed as to which duck breed will best suit. Ultimately, your choice when raising ducks, will come back to the question you should be asking yourself, right from the start; "Why do I want to keep ducks?" Do you want ducks for eggs, ducks for meat or ducks for snail and fly catching? Ducklings are easily sourced through a neighboring farm, breeder or your local feed dealer. The best time to get your ducklings in would be from April through to July. If you want to raise ducks for meat then you would need to decide on the number of ducklings you will need to buy for your operation. But on a small-scale, getting in 1 dozen ducklings 3 times a season you could start eating duck from mid-June through to late fall. Ducklings are hardy to raise, and need 3 weeks of artificial heat before you can put them to pasture. If your duck lays eggs and leaves the nest, you can put them under a broody chicken, as long as the eggs haven't been left for too long. However, due to the large size of the duck eggs a chicken can only comfortably sit on 7-9 duck eggs. You will need to make sure that the eggs are sprinkled with water regularly, especially towards the last few days. If you are raising ducks for eggs then you are after you can't go wrong with the Indian Runners which are probably the best egg-laying ducks around. They lay around 225-330 eggs a year but produce more heavily during spring and summer. Some will say that the Campbell (Khaki) duck is the better layer, but they are probably even in egg production. The Campbell is a placid bird with fair mothering instinct, whereas the Indian Runners are a little nervous but make excellent mothers. If you are raising ducks as meat birds Aylesburys, Pekins, Rouens and Duclairs make good table birds weighing in at 4-5 kg for an adult Aylesbury drake. Pekins are the fastest growing bird out of the 4, although don't weigh as much and Pekins and Aylesburys are the only 2 breeds that produce white meat. However, neither Pekins or Runners make good sitters, and you are probably better off with Muscovy ducks or Aylesburys, my personal favorites, as they are good dual purpose birds. Muscovy drakes will weigh 4.5 kg at maturity, and females will weigh 3 kilos. Another reason why I like Muscovy ducks is that they don't quack, and so therefore the perfect bird if you live in the suburbs and you are worried about annoying your neighbors. However, they are a bit flighty, so it is prudent to clip one of the wings regularly. Just remember to keep the right ratio of ducks to drakes if you are breeding ducks. One drake to 2 ducks to start with or one drake for every 5 or 6 ducks will keep him happy. If you do keep ducks for meat, make sure that you like duck! Even 1 duck can hatch 25 - 30 ducklings in a season, as they hatch ducklings twice a year. If it is your aim to raise ducks for meat then you will be provided with tasty duck meat from spring until late fall. You can start slaughtering your ducks after week 9 or 10. Usually but week 10 they are fat enough, but you will need to determine this by examining your ducks carefully. There is no point at slaughtering at this age if they don't have enough meat on the bones. However, something else to consider here is that at about this time your ducks will start to moult. No matter how much you feed them after this period, they won't put on much weight and whatever weight they do gain will be done very slowly. If you are allowing your ducks just to forage for food without any additional feeding your ducks will take a lot longer than 9 or 10 weeks to gain weight for slaughter. If on the other hand, you are raising ducks for both meat and eggs, the dual-purpose Aylesburys win hands down, producing about 170 eggs a year and have the advantage of having a placid nature too. However, Orpingtons, Blue Swedish, Muscovies, Saxonys, Cayugas, Appleyards and Crested ducks can also claim the title of good dual-purpose birds. Another factor for raising ducks and choosing a duck breed will be based on how much space you can offer your ducks. If space is a premium then you should be looking at smaller breeds like Elizabeth ducks, or the Black East Indian Ducks. There are also bantam ducks now, the Silver Appleyard is one such example, as is the Miniature Crested duck. A word of warning about bantams - because of their light weight they are great fliers and any new birds should be either clipped/pinioned/ or placed in a covered pen until they settle. They are also best bought as pairs as single pet females often fly in spring to find a mate. It is wiser to buy them as ducklings. As they grow up in familiar surroundings they are less likely to fly away as adults. Ducks are great foragers and are quite happy to eat the snails, flies and bugs in your garden. 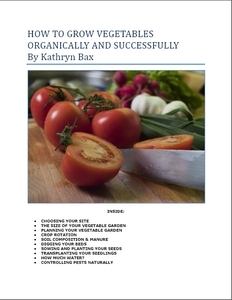 Unlike raising chickens, when you raise ducks they won't destroy your flowers or your vegetables if you let them loose in your garden, although they may nibble at your new pea shoots and seedlings and other leafy crops. So don't put them in your veggie gardens if you don't want them to eat your new lettuce and spinach seedlings. However, if you can put up with that, the advantages of having them there in your veggie patch eating cutworms, caterpillars, slugs and snails far outweighs the slight damage to your vegetables by having them there. In addition, they will be leaving behind their manure which is high in nutrients and nitrogen which will go back into the soil. Ducks will also have a go at eating any fallen fruit in your orchard and this is a good thing too, because any fruit flies that may think of laying eggs will soon be preyed upon by your resident ducks. You may also like to suppliment their diet with chopped tomatoes, hard-boiled eggs and earthworms. However, foraging for food is not enough for a duck if you want it to be a good layer, and to be a fat bird for your table. You will need to feed your birds twice a day; early morning and late afternoon. Give each adult bird 180-200g of a good grain mix. This can consist of corn, wheat, barley and flaked oats. All will be warmly welcomed by your ducks. From time to time add cut up spinach and leafy greens to their diet if they are not getting that already from your veggie patch. Stale bread can also be given as a treat from time to time. Ducks are waterfowl and need a pond or a bath of water to dip themselves into every day. In fact, ducks spend about 80% of their time on water and those that don't have access to water start showing abnormal behavior. Not only that, but a duck that doesn't have access to water to clean its eyes on a regular basis will go blind. So raising ducks successfully means that you will have to give them access to a small pond or the like. Make sure that they have enough water to swim and play in, and where possible it should be cleaned out once a week and filled up again with clean water. Sinking an old plastic clam sandpit that your children have out grown is one way of recycling and providing water for a couple of ducks. However, any pond built for your ducks must be constructed in such a way that all ducks and ducklings can get out easily. Therefore slanting the clam sandpit slightly allows for the ducks to get out safely. If ducks are unable to get out of the pond that you have created, they will tire themselves in trying to get out, and will in fact drown. Drinking water for ducks must be provided at all times, and kept clean. Ducks like to put their whole bills into the water to drink, and therefore the water needs to be at least 4 inches deep for adult ducks and at least 12 inches across. Foxes are a duck's worst predator and your duck houses should be constructed in such a way that your ducks will be safe at night. This means that any fencing should be high enough to prevent a fox from jumping over or even climbing over - yes foxes can climb fences! And the fence should be buried at least 15-20 cm below the soil line to prevent him from digging his way into the duck pen. The duck house should be sturdy, well-ventilated but not draughty. It should be water-tight and the opening should be facing away from the prevailing weather. Litter should be placed on the floor and removed once a month and included in your compost heap. Nesting boxes can be placed whereby they can be opened from the outside, which is very convenient for those collecting the eggs. Unlike chickens, your ducks do not need perches. Occasionally when raising ducks they will fall ill, although they are quiet hardy, and illnesses are rather unusual. Most of the time problems arise when water has been allowed to go stagnant, when they have been fed rotten food scraps, haven't been fed the right diet, been wrongly dosed for worm medication or have been bitten by snakes, or stung by bees, wasps, spiders or ants. To prevent your ducks from getting worms add a small amount Condy's crystals in the duck's drinking water once a week. The crystals line the gut of the duck preventing any parasites from sticking to it. Another excellent additive is a capful or two of cider vinegar. However, if you are adding cider vinegar to the water, make sure that the water is in a plastic container, and not a metal one, as the vinegar will cause the metal container to leach. A small amount of garlic given to your ducks from time to time is also a preventative against worms and parasites. Your birds should be housed in sanitary conditions that are well-ventilated but not draughty. They must be released from their duck house every day. These should be cleaned weekly. Like all birds they can also be susceptible to mites and worms, and should be treated for these accordingly. Any serious illness should be attended to by your local vet. Raising ducks is a rewarding experience, and if you are into permaculture, they are a vital player in your farm's ecology. They eat the snails, slugs and other nasty bugs in your veggie garden without destroying your greens. In addition, they provide great farmyard manure to enrich your soil. 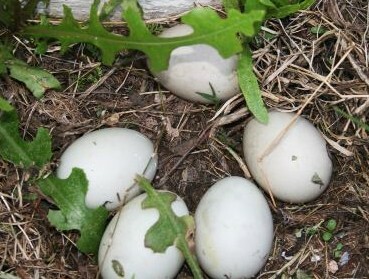 Depending on the breed, you will be provided with a clutch of duck eggs on a regular basis, and a bird or two will grace your dinner table from time to time. The humble duck is a very worthwhile farm animal indeed! You can Add your Comments on Raising Ducks! We have lots of pages where you can contribute to throughout this website. We love hearing from our readers, and hope you will be one of those we hear from too. Look around our homesteading website. If you have a comment to make about raising ducks, please submit them. All you need to do is type and submit. We will do the rest! What is the average clutch size for pekin ducks?